I post a cocktail on this space about as much as I drink one: once a year. 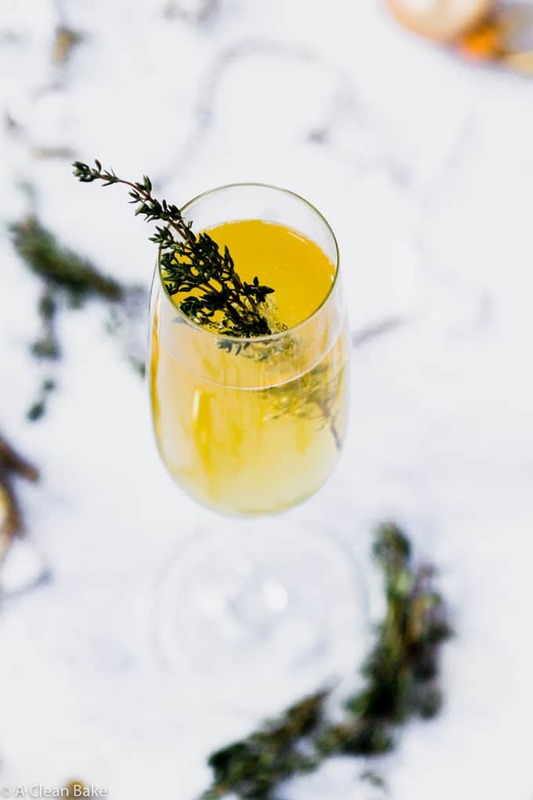 I’m not a big drinker in general, but I do believe in the importance of something sparkly in a glass to celebrate big moments. And the beginning of a new year is, though you can count on it happening once every 365 days, a big moment. It might be arbitrary, but I like how everyone has collectively decided that things reset on January 1. It’s a clean slate, even if only mentally, and a chance to leave the last year behind and approach the next one with gusto. Granted, that optimism may quickly fade back into what can only be attributed to the reality of being the same person you were on December 31st, but once in awhile, it sticks. My (possibly pipe dream) resolution for 2018 is to be better rested. Reasonably so. Like, one notch above the fumes I’m currently running on all the time. I’m not going to lie: 2017 was, at times, a pretty grueling year. 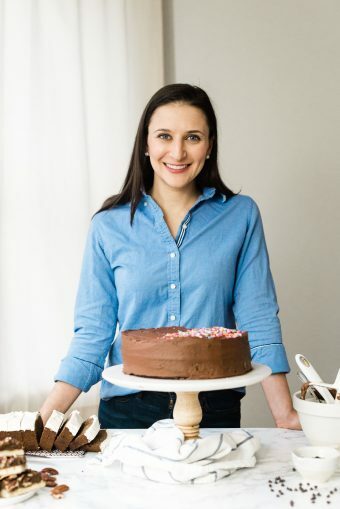 …more of your favorite sweets and desserts, made over into a delectable grain free and naturally sweetened version. …more easy dinners that you can make in 30 minutes, in your slow cooker, and/or in your Instant Pot (I finally got one, too, and I GET IT now!). …more snacks that are quick to make and reliable sources of steady energy when you’re facing the dreaded 3:00 slump. …more breakfasts that are worth getting out of bed for. …more recipes that can be made ahead and frozen, prepped at the beginning of the week, or batch cooked, so that you don’t have to worry about slaving over the stove every.single.evening. You deserve a break! …more of — what else? I need your help to complete the list! With that in mind, I would be so grateful if you’d be willing to complete this super quick survey about what you think about A Clean Bake. There are only 9 questions! See? Wasn’t that easy? It was over almost as quickly as it began. But, I think we should still celebrate. Pretend the survey was grueling so that we can toast its completion, or celebrate the end of the year, the beginning of a new year or, well, whatever else ya got. The ginger-honey simple syrup can be made ahead of time. Store in an airtight container in the refrigerator until ready to use (up to 3 days). 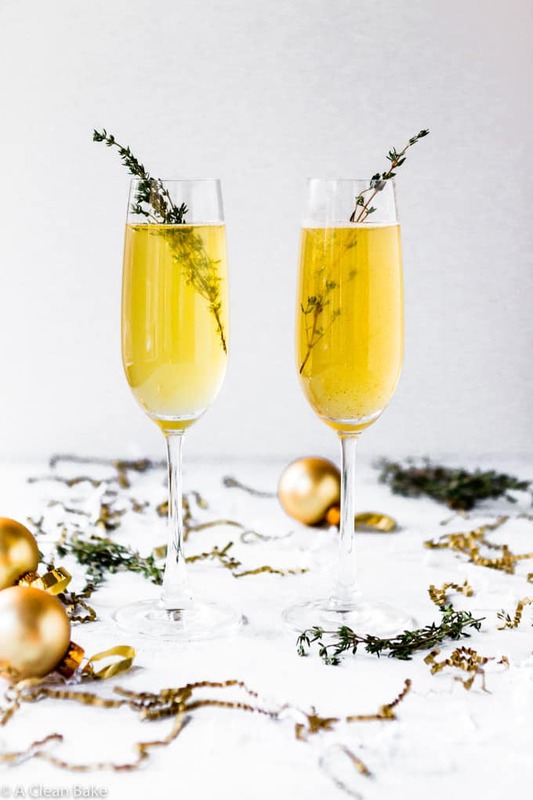 Use an additional Tablespoon or two of apple cider, plus a sweeter champagne, to make a sweeter drink. 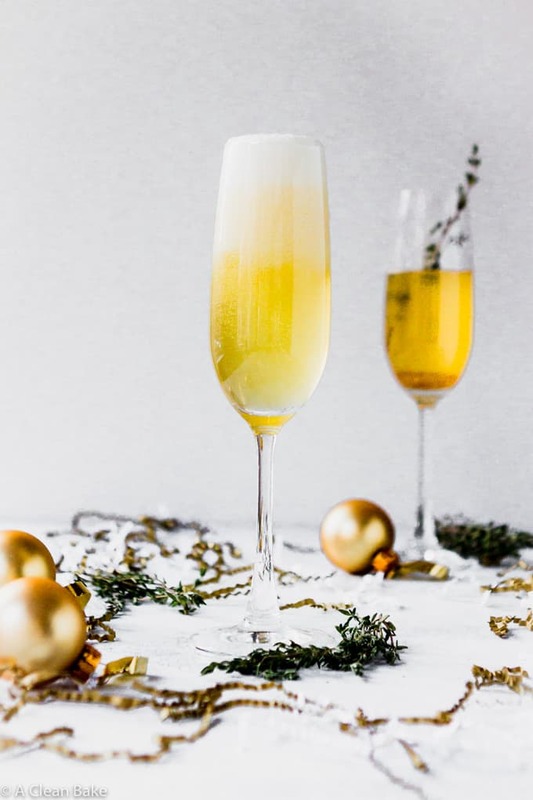 Use dry champagne for a less sweet version. 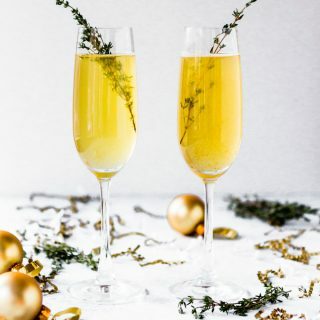 Use sparkling apple cider for an alcohol free version. You may want to reduce the honey in the simple syrup, though, unless you want a very sweet drink. 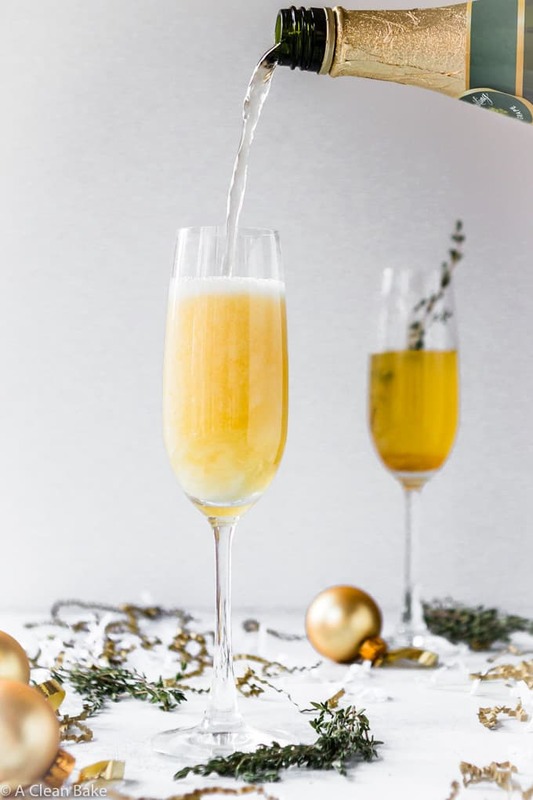 With a drink so versatile, there’s no reason to toast the new year with anything else! Happy 2018! Add the water and ginger to a small saucepan. Cover and bring to a boil. Uncover and boil for 5 minutes. Strain out and discard the ginger pieces. Add the honey to the liquid, and stir to combine. Let the ginger-honey mixture cool to room temperature. 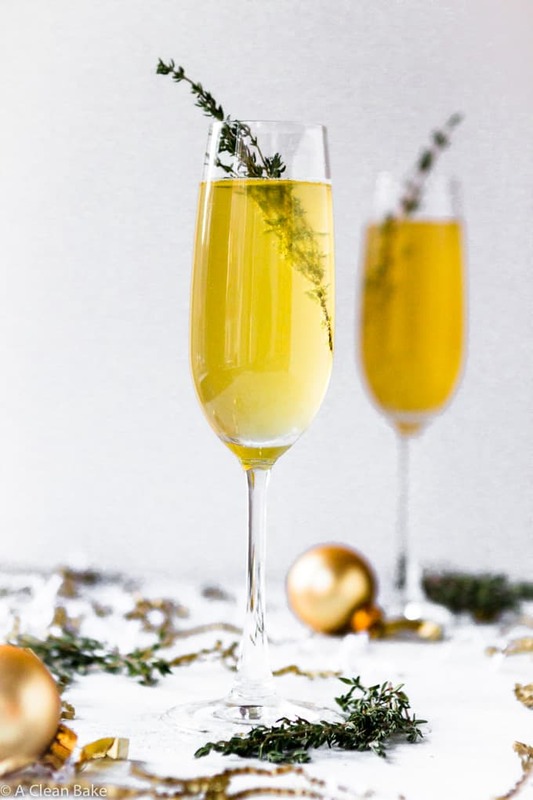 Add 1 Tablespoon simple syrup and 3 Tablespoons apple cider to a champagne flute. 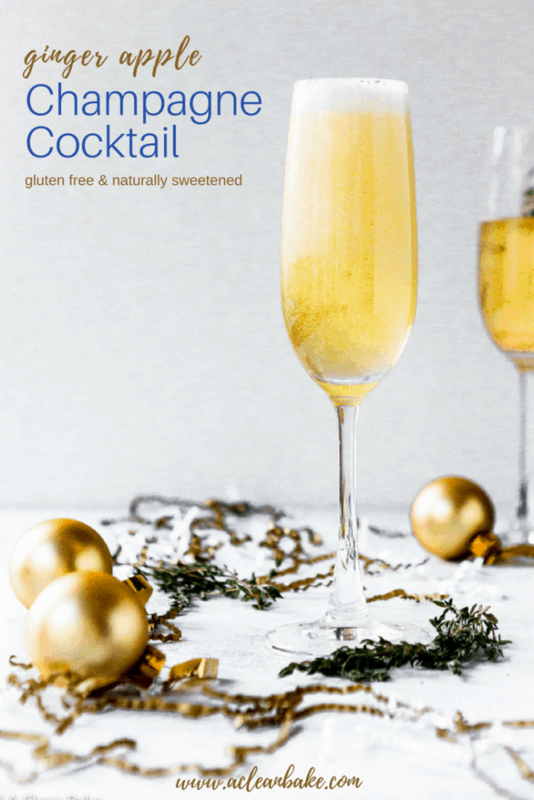 PS: Looking for other New Year’s Eve cocktail and mocktail ideas? I have a few here that you might like!